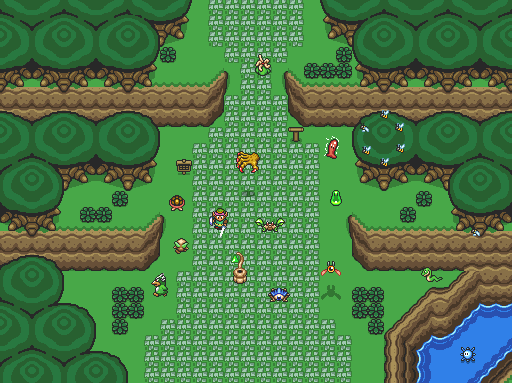 I really like Four Swords Adventures sprites. They are very pretty, and really fits with A Link to the Past style. It's quite normal : this 2D game, developped on Gamecube, uses ALttP-like graphics, as an artistic choice. *Well ... when I said I'me almost done with the ripping ... Not completely : I've still not ripped soldiers, nor Stalfos/Hinox, because they use complexe sprites and are a pain to build !!! Here is Four Swords Adventures page on The Spriters Ressources. You can find all my rips in the submissions named "Land enemies", "desert enemies" & "dungeon enemies". You can also find Octorok/Eyegore, which have been ripped by other persons on this page. Re: [Tileset] Enemies from Four Swords Adventures ! Yeah I was precisely thinking about this, and you made it ! Thanks!